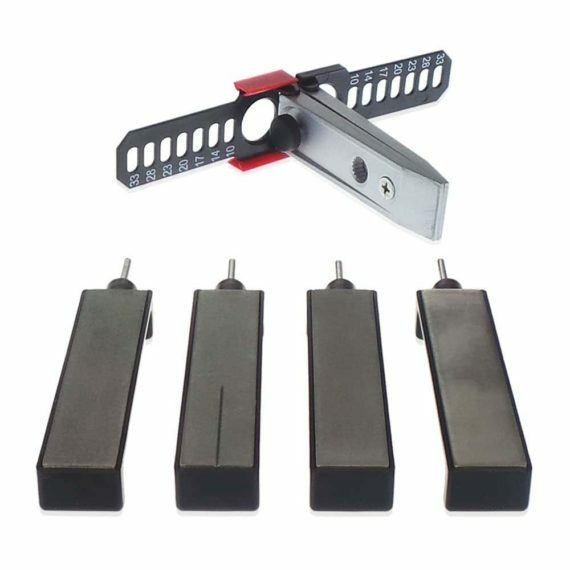 The Blade Tech Glide Multi Angle Sharpening Kit is a clamp based system and has 7 sharpening angles ranging from 10 degrees to 33 degrees which means you can now sharpen almost all of your knives and tools with just one, handy sharpening kit. This diamond based system contains a comprehensive kit including; blade clamp, angle guides, 4 different grades of diamond coated sharpening plates (Extra Fine, Fine, Medium and Coarse), honing fluid and a bench mounting stand. This kit contains all that is required to produce a razor edge on all knife blades, especially where the angle is required to be maintained. A storage box is also supplied with the kit, to ensure that the contents are stored safely and at hand whenever they are required.